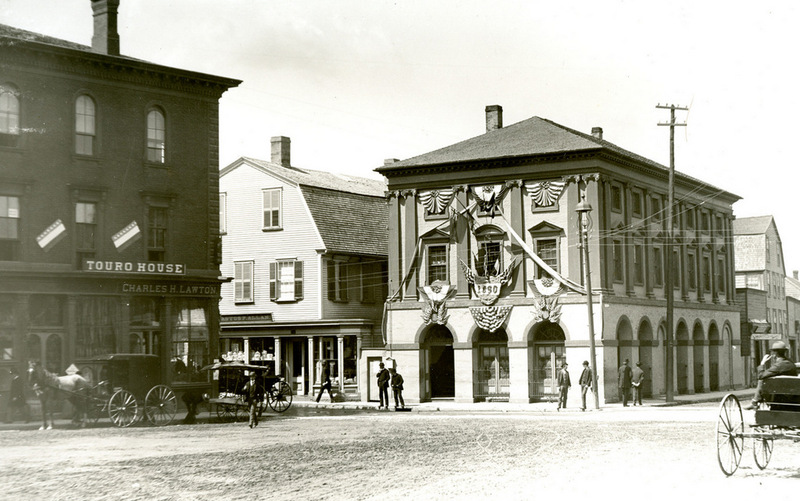 The Brick Market on Thames Street, opposite Washington Square in Newport, in 1890. Image courtesy of the Providence Public Library. 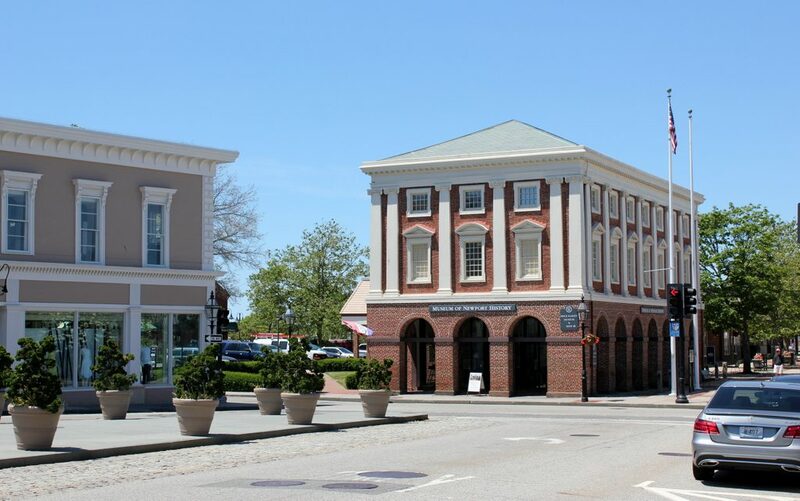 Downtown Newport is renowned for its many colonial-era buildings, but one of the finest is the Brick Market, located along Thames Street at the western end of Washington Square. It is a prominent architectural landmark, and is one of only a handful of surviving buildings that are known to have been designed by Peter Harrison, one of the first formally-trained architects in America. Born in England in 1716, Harrison came to Rhode Island in 1740 but returned to England a few years later, where he studied architecture. Upon returning to the colonies, he designed several prominent buildings in New England, including King’s Chapel in Boston, Christ Church in Cambridge, and the Redwood Library and Touro Synagogue here in Newport. The Brick Market was the last of his confirmed works, and is shows the influence that English architecture had on his designs. The building’s design was based on the Old Somerset House in London, with Harrison copying elements such as the arcade on the lower floor, the pilasters on the upper floors, and even the alternating arched and triangular window pediments. He designed the Brick Market in the early 1760s, and construction began in 1762. However, financial difficulties delayed the construction, and it was not completed until 1772. Upon completion, the building consisted of an open-air market on the ground floor, similar to other contemporary New England marketplaces such as Faneuil Hall, while upper floors were used for offices and dry goods storage. However, over the years the building’s use changed several times, starting in the 1790s when the upper section was converted into a theater. Then, in 1842, the building was converted into Newport’s city hall, which included removing the third floor and replacing it with seating galleries. It was still in use as city hall when the first photo was taken in 1890, and it would remain so for another decade, until the current city hall was completed in 1900. By the early 20th century the Brick Market was in poor condition, but it was restored in the 1920s by Norman Isham, an architectural historian and professor who specialized in preserving colonial-era buildings in Rhode Island. The building is now owned by the Newport Historical Society and operated as the Museum of Newport History, where it stands amid modern shopping plazas. All of the other historic buildings on the west side of Thames Street between Marlborough Street and Memorial Boulevard have since been demolished, and today the only other building still standing from the first photo is the one on the far left, at the corner of Thames and Touro Streets. Known as the Henry B. Young Building, it was built in 1861 but was heavily altered in the 20th century, including the removal of the top floor, and today it bears little resemblance to the building from the first photo.